3 fishermen were rescued by the Sanya maritime rescue team after their fishing boat stopped working when fishing in the sea area off Nanshan Mountain, reports hi.people.com. The maritime rescue team from the Sanya Base of the South China Sea Rescue Department dispatched a high-speed rescue boat after receiving a help call from the 3 fishermen on the broken-down boat at 10:25am on 22nd April. 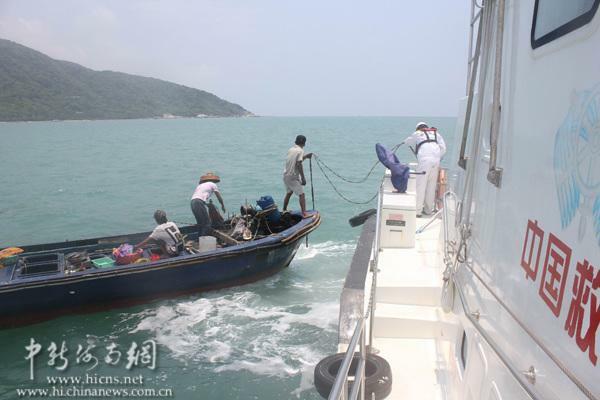 At 14:35, the fishing boat was found on the sea near Nanshan and 3 fishermen on the boat were successfully rescued.